The Incline girls golf team poses with its NIAA Class 2A state championship trophy on Tuesday at Incline Village Championship Course. Pictured, left to right, are: Coach Joe Humasti, Karyss Thompson, Haley Carlson, Scarlet Thompson, Kennedy Cohn, Christine Schwartz, Coach Chuck Jensen. Incline High School coach Joe Humasti has spent more than 30 years giving back. And after a three-decade run at Incline, which saw him bring 15 state titles to the school, the longtime Highlanders coach will be enshrined into the Nevada Interscholastic Activities Association (NIAA) hall of fame. “I’d like to thank all of the athletes I’ve coached, both current and past, my fellow coaches, the Incline High School student body and administration, and all of the members of the Incline Village community for all of their help and support during my 30 years coaching at Incline High School,” Humasti said. 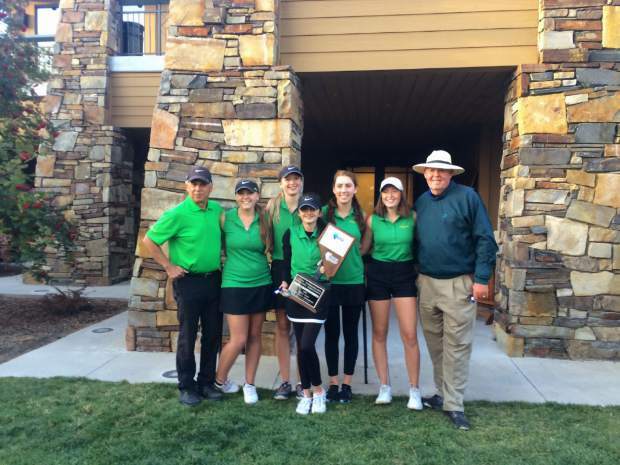 The Incline coach goes down as one of the most successful in the history of Nevada high school athletics, and the state’s most decorated girls’ golf coach with nine state championships. Humasti’s path as a coach was forged through tragedy. As a young man he enrolled at Southern Oregon University, moving from his hometown in Palo Alto, Calif., where both his parents made careers as educators. During those next two years both his mother and father would pass away from cancer. Devastated, Humasti was left to pick up the pieces. But a community rallied around him and his sister, and it was through that outpouring of support that Humasti was able to push through. Because of the help he received from those around him, Humasti in turn spent the next 30 years of his life giving back by mentoring youngsters as a coach, using his own personal tragedy as fuel to inspire generations of students. “I wanted to give back,” Humasti said. “When my folks passed away in Palo Alto, a lot of people really helped my sister and myself in a tragic situation, and so I wanted to give back to all of the people who helped me. Humasti went on to begin a teaching career in Woodland, Calif., and later moved to Tahoe in 1978. From there, he’d go on to rack up 15 state championships while coaching alpine skiing, basketball, tennis, and golf. Humasti has also coached 23 individual state champions during his career and finished as a state runner-up eight times. It was more than championships for Humasti. The main focus was encouraging his athletes to simply due their best, while imparting lessons of life through competition and struggle. The strategy was a simple one that Humasti said he learned from legendary coach John Wooden, and the filled trophy cases at Incline and countless lives Humasti has touched are a testament to that approach. While Humasti began his career as Incline’s tennis coach, it was on the fairways and greens where he found his most success. As the Lady Highlanders golf coach he totaled an NIAA record nine state championships, all of which have come on the Class 2A level. Humasti’s run of five state championships from 2012-16 is tied with Wooster’s Sharon Klise (1972-76) with the most consecutive state titles in NIAA history. Incline’s streak was snapped this season with a third-place finish at this year’s state championships in West Wendover. Humasti also won three straight titles from 2000-02, and as a coach has pulled Incline even with Reno for the most girls’ state golf titles in Nevada history at nine each. Humasti coached the Incline boys’ golf team as well, winning Class 2A state titles in 1993 and 2015. He served as the team’s coach from 1991-2016. Humasti’s skills as a coach haven’t been limited to the fairways. During 2007 and 2008 he coached Incline’s alpine skiing teams to slalom, giant slalom, and combined state titles, becoming the only coach in school history to have won a state title at the Class 4A level. Humasti, along with nine other members of the 26th hall of fame class selected by the NIAA, will be inducted during a ceremony in Reno, Nev., on Thursday, March 22.